A couples baby shower is a great way to make sure that both the guys and the girls in a tightly-knit group of friends can celebrate the parents-to-be together. Also known as Jack and Jill baby showers, couples baby showers tend to be far less frilly and girly than traditional baby showers, while still allowing guests to bring baby gifts and play fun baby shower games. Few things entice men to show up to an event like free beer. And women are keen on enjoying some brewskis too (with the exception of the mom-to-be, of course!). A “baby is brewing” themed baby shower is a great way to let couples cut loose and throw back a few cold ones while showering the parents-to-be with everything they’ll need to welcome their new baby. There’s so much to love about the Cheers Couples Shower Invitation below that we don’t even know where to start! The onesie shape is charming, the foaming beer graphics are bright and fun, and the neutral color scheme is appealing to guys and gals alike! We love the idea of stripping the labels off of empty beer bottles and growlers and using them as fun beer-themed centerpieces for a “baby is brewing” themed shower. Somehow putting a couple stalks of baby’s breath in a simple brown bottle is the perfect combination of masculine and feminine! We love how tasteful this idea comes across in this mantle decor photo taken by Jamie Brown Photography. A themed party banner and a tasteful chalkboard that says “Cheers!” add to the charming, beer-themed decor. Traditional brewpub food is a great choice for a beer-themed couples shower. Think pulled pork sliders, smoked beer brats, soft pretzels with dipping sauce, or loaded potato skins. Appetizers might include beer battered onion rings, cheese curds, and little bowls of mixed nuts. We love the bar-themed spread below featured on Chicago Now. For something sweet, a beer-infused cupcake is a fantastic option. We thought the Little Sweet Baker’s chocolate Guinness cupcakes with maple cinnamon frosting shown below were an excellent choice. The pretzel garnish is charming, but you can also use beer bottle caps for a fun cupcake topper. The traditional lumberjack uniform of red and black plaid actually has a name — buffalo plaid. This warm pattern takes center stage at a LumberJack and Jill baby shower. Crisp fall and winter weather already makes you want to bundle up. Why not encourage your guy and girl friends to wear their favorite flannel shirt to your couples-friendly shower? Invite Shop has the perfect invitations for a LumberJack and Jill baby shower. The Red Buffalo Plaid Baby Shower Invitation below features a red and black flannel color scheme, a woodgrain background, and a pair of axe graphics that play up the lumberjack motif. It’s the perfect way to announce your theme. Incorporate a simple red and black color scheme throughout your shower decorations using buffalo plaid fabric from your favorite fabric store. Drape a length of buffalo plaid fabric across the top of your dessert table as an accent, or fasten a section of this fabric to the wall as an anchor for a food station backdrop, like the example below featured on Wit & Wander. A clever chalkboard sign proclaiming your lumberjack theme is another fun way to jazz up your decorations. 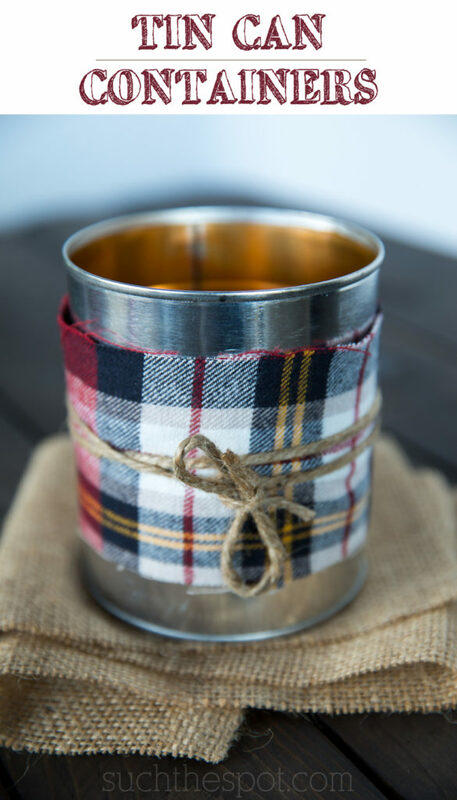 We love the example below that we spotted on Mini, Mama & Co.
Last but not least, use twine to tie scraps of plaid fabric around empty tin cans to create adorable DIY centerpieces, like the example below featured on Such The Spot. You can fill these little beauties with flowers, candles, or even party utensils! Lumberjack themed food can include favorite foods enjoyed around the campfire, like hearty chili and gooey s’mores. Presentation is also important. Try displaying your shower treats on tiered wood rounds, like the photo from Design Lively, which shows off some tempting maple bacon flavored cupcakes. What lumberjack doesn’t love bacon? Flapjacks and breakfast sausage links are another great sweet and savory pairing for a lumberjack baby shower, especially if the shower is timed around brunch. You might also try your hand at the clever lumberjack cake below featured on Sugar Geek Show. While the cake looks super intricate, a handy tutorial reveals the cake is not as complicated as it first appears! Men and women both enjoy a good BBQ. However, firing up the grill or smoker is one of those tasks men just tend to get excited about. Since baby showers are traditionally designed for women, it’s important to look for themes that give men a bigger opportunity to get involved. A “BabyQ” fits the bill perfectly! A Western-inspired font and barbecue grill graphic are front and center on Invite Shop’s BabyQ Brown and White Baby Shower Invitation. The earth-toned color scheme is appealing to both men and women. If the BabyQ will be a potluck, be sure to include that information on the invites so couples know to bring a side dish. For a BabyQ couples shower, a simple red and white checkered tablecloth is a good anchor for all your other BBQ-themed decorations. Fill mason jars with sunny yellow sunflowers and baby’s breath for a “summer picnic” vibe, like the example below from Cultivate Create. You might also create a simple pennant party banner out of burlap fabric and twine. BabyQ food can be as simple as throwing hamburgers and hot dogs on the grill. Have some chips and dip on hand and some yummy little smokies out as appetizers so that no one is left hungrily waiting for the food to come off the grill. Play up your BabyQ theme with some cute custom BabyQ cupcake toppers. We love the example below from Tangerine Paper Shoppe on Etsy. A luau couples shower is one of the most popular themes out there. Decorations are cheap and easy to come by, and guests enjoy donning tropical shirts and grass skirts for the festivities. For inspiration, we love the luau-themed party table below featured on the Oh My! Creative blog, which takes readers through how to achieve this fun look for themselves. A photo of the parents-to-be takes center stage in the Tangerine Floral Hawaiian Luau Couples Shower Invite from Invite Shop. We think the subtle hibiscus flower graphics in the background add a charming touch. If you want your friends to come dressed in tropical attire, be sure to include that in the invitations. Luau party decorations are almost always easy to find at dollar stores and discount party stores, but there are always a few things you can do to add your own personal touch. We love these pineapples that have been painted with bright tropical colors that were featured on the Pursuit of Shoes blog. Another showstopper at your luau couples baby shower are these larger than life, DIY tissue paper flowers that were featured on the Uncommon Designs blog. Big, bold statement pieces like this can brighten up any event. Traditional luau food generally includes kalua pork, teriyaki chicken, rice dishes, and macaroni salad. Since luau food tends to be somewhat monochromatic, bring color in with fresh tropical fruits, like the luau-style fruit on a stick below decorated with faux tropical flowers that was featured on Diddles & Dumplings. We hope these ideas inspire you to plan a fun and memorable couples baby shower that men and women can both thoroughly enjoy!